The Dutch Republic was one of the great European powers during the 17th and 18th Centuries. Generally, the Dutch Republic was considered to have lost that status after the 1713 Peace of Utrecht; however, when the Republic entered the War of Austrian Succession in 1740, it was able to field an army of over 80,000 men. This expanded to over 110,000 men during the war, demonstrating that the Republic was still a European power to be reckoned with. The losses suffered in that conflict led to a period of decline, which in the end would result in the end of the Republic in 1795. But despite the years of neutrality, shortages, budget cuts and reorganizations, the army was still quite a formidable force. The purpose of this book is to focus on the uniforms and organisation of that army, from the Peace of Utrecht until the reforms of 1772. 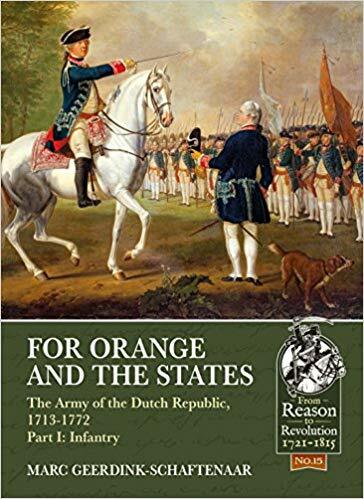 The army of the Dutch Republic is a subject that sounds familiar, but is yet greatly undiscovered; little of it is known, unlike the armies of Britain, France, Prussia, and even the lesser powers like Sweden and Denmark. Historical sources of it, be it surviving items of uniform and equipment or paintings and prints, are unfortunately scarce. This study brings to light much material previously-unseen.